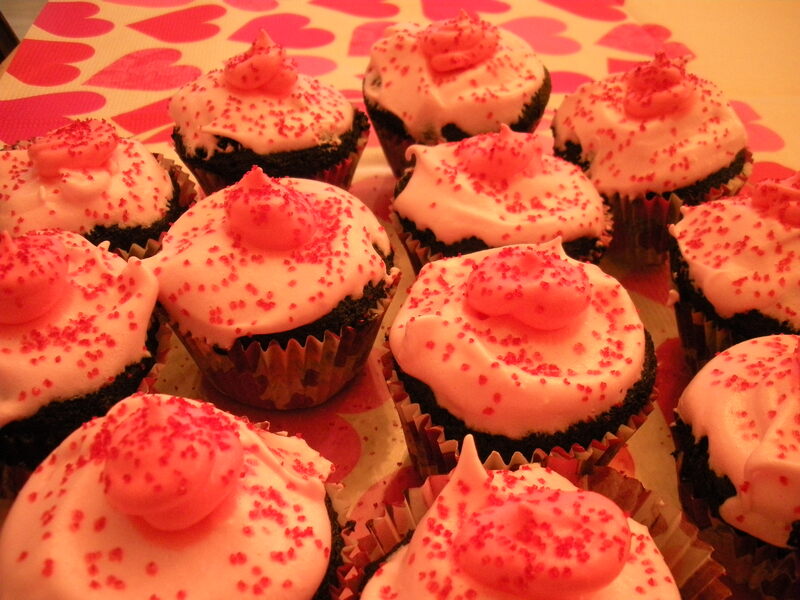 Roses are Red, Violets are Blue…..
Wouldn’t you like one cupcake too? Last minute on Thursday night we decided that it was time to invite some friends over for Shabbat dinner since we don’t do it so often because we always go with family. 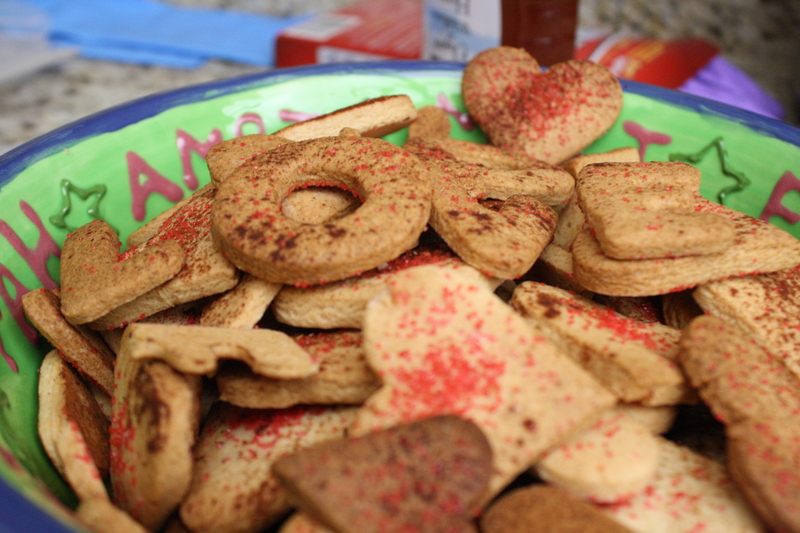 So we had some friends over and since it’s Valentines day this weekend, I decided to infuse my dinner with some v-day fun! The meal came out really really yummy, even the rice was yummy after burning it the first time around… will leave that story for another time (or never!) lets just say that I might need a rice cooker to be safe :). But Adam took care of the rice and we were safe. So dinner was really yummy… we had chicken with eggplant and potatoes, salad, rice, and beans. BUT DESSERT was spectacular. I made delicious cupcakes with frosting that even though they were amazing the frosting still needs improvement. The frosting just needed a KitchenAid mixer and more time for the sugary concoction that you have to make. After many hours of looking at recipes for this weekends entry and thinking what I wanted to make that was somewhat easy because I didn’t have much time yesterday, but also something delicious, I decided to make chocolate cupcakes that everyone likes. I used the recipe from Joy the Baker‘s blog and I made a few changes to her recipe. 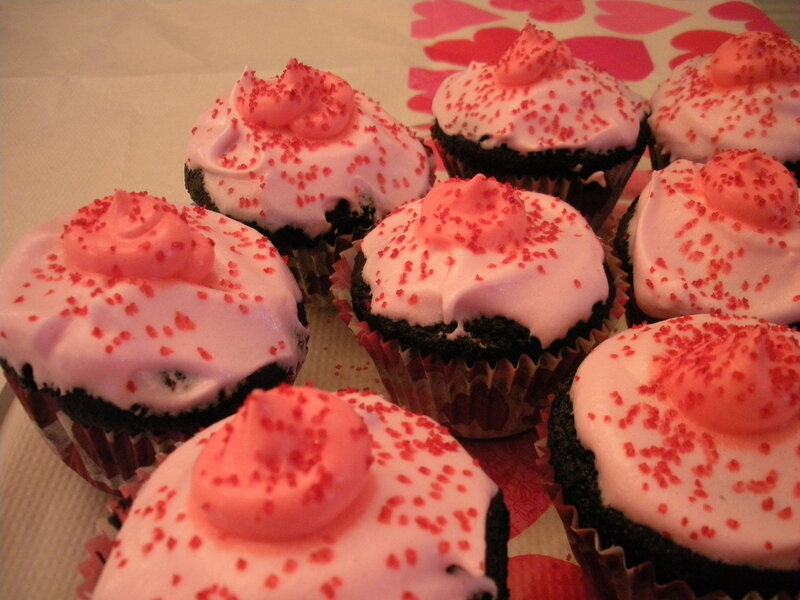 The coolest part of the recipe is that the cupcakes are vegan, not that I am a Vegan, but I thought that it was nice. I used Joy’s Sweetheart Rose Cupcakes recipe for my cupcakes. The recipe makes about 24 cupcakes and she uses a lot of organic ingredients that I just did not have at home. Line two cupcake pans with paper liners and set aside. Slowly whisk the wet ingredients into the dry ingredients being careful not to over mix. This is my grandma’s recipe and its one of those recipes that you add a little bit of this and a little bit of that. These measurements are pretty much the standard for it. So the frosting is a little more complicated because you have to beat egg whites and people always complain that this is difficult. With a very weak hand mixer, I beat two egg whites until very stiff. With a powerful mixer you get beautiful egg whites. While you are beating the egg whites, you boil the water, sugar, and honey until it starts to bubble. You know the mixture is done when you stick a spoon and you pull it out and you get like a string hanging. You are creating some sort of syrup. Just be very careful not to touch with your hands because it can burn you hard…. Once you have the syrup ready, you lower the speed of the mixer to slow and slowly add the syrup and then bring the mixing up to high again. Your frosting should grow beautifully big and be very fluffy and sticky. 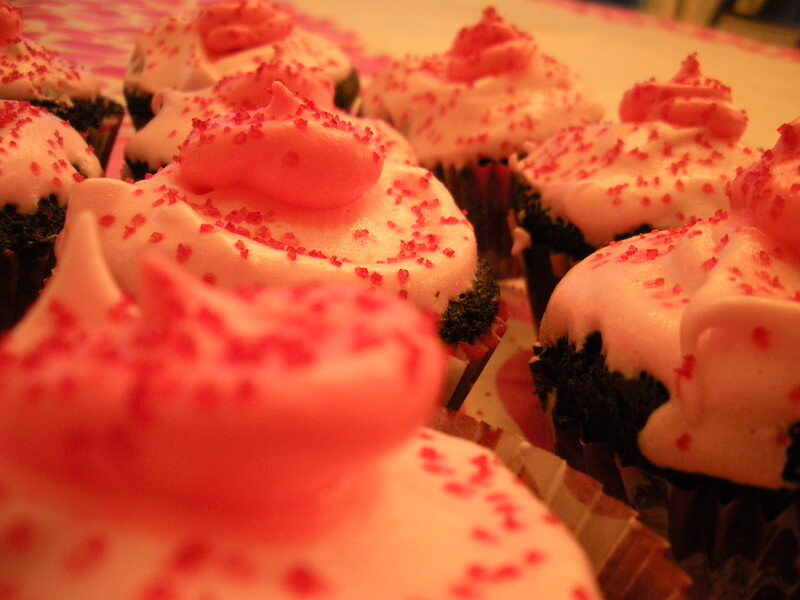 You can add food coloring if you want to make colorful frosting and sprinkles to decorate your cupcakes! 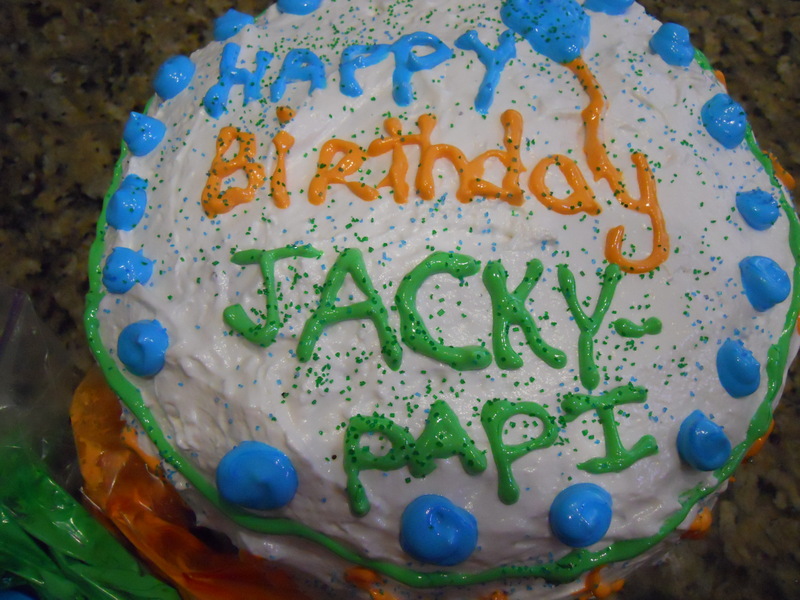 Since I did not have a strong mixer, (this is the third time I mention this… maybe I am upset at the fact that I haven’t gotten myself the KA mixer but that will come when we move into our own place) and I was doing this by hand I had a little trouble with my frosting. It still came out pretty good and fluffy but not as good as if you let the sugar become a syrup and you beat the egg whites hard. Here are some images so that you can somehow experience the grandioseness of my creation. Ok, I have to go and have another one…. they are truly spectacular. Oh by the way, while doing research for this recipe I found some really cool chocolate cupcake recipes I will be trying soon… lets just get through this batch first. 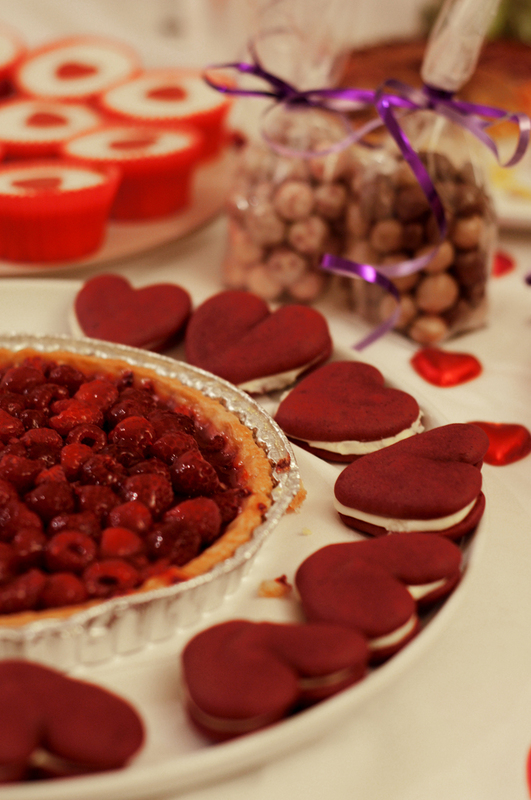 Tomorrow we are invited to a V-Day BBQ so I will be bringing some sort of dessert…. so until then…Τα λέμε! Cupcakes: Roses are Red, Violets are Blue…..